Eden in Broughton, near Skipton, Yorkshire sleeps 12 people. Eden near Skipton can be seen as you pass the magnificent stately home of Broughton Hall and climb up the single track road through the estate. 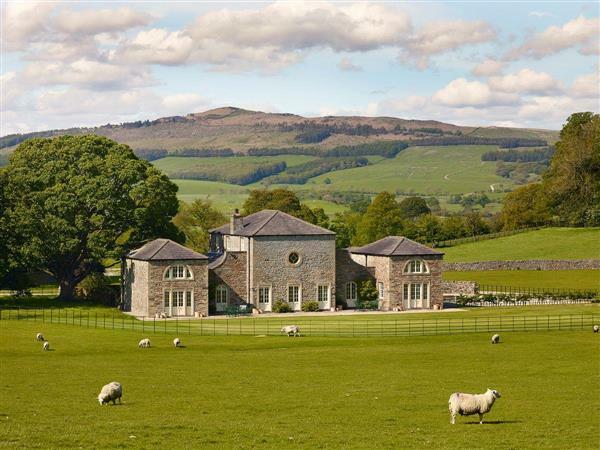 This magnificent detached house commands a secluded position, surrounded by the 3000-acre grounds of the Broughton Hall Estate... and a few sheep! A popular venue for a wedding and perfect for a group of friends or a family gathering, Eden offers plenty of space and comfort for everyone. 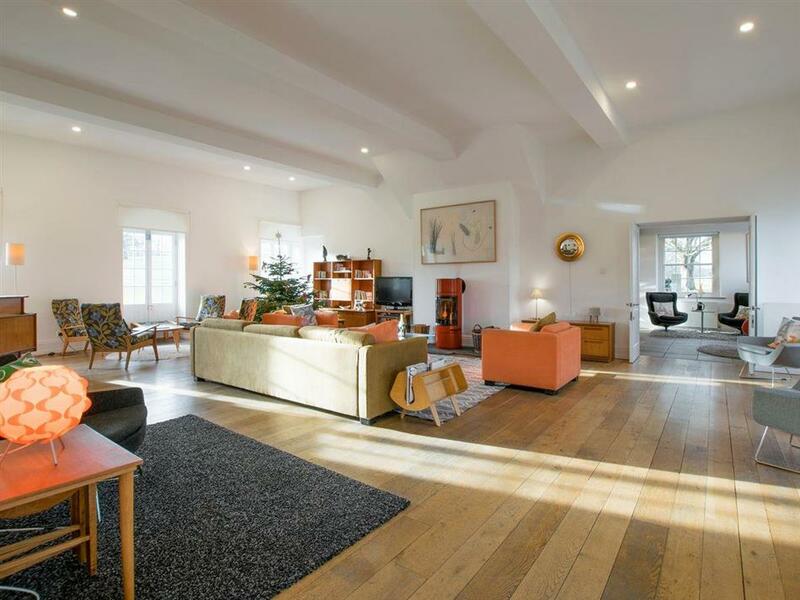 The huge, high ceilinged living room provides a stunning space for everyone to get together in one room. The kitchen is flooded with light thanks to the cathedral-style window and French doors. With a large central island and breakfast area it will be the hub of the house for a natter over a cup of coffee each morning. The traditionally furnished dining room provides contrasting décor to the stylish and contemporary furnishings throughout the rest of the house, but gives ample opportunity for all guests to dine together. A simple relaxation/reading area at the bottom of two staircases provides a quiet retreat. One staircase leads to just two of the bedrooms and a bathroom which gives privacy to those who want to slip away early or to a small family. There are two bedrooms and a bathroom on the ground floor as well as level access throughout the house. Outside, a sunken wood-fired hot tub for 6 guests provides further relaxation opportunities and the vast expanse of flat lawned garden is ideal for ball games. If you’re planning a party, it’s the prime spot for a marquee to extend the celebrations! Hidden within the two-storey garage is a bar and children’s room, ideal for all guests. Wander through the huge grounds, meander along the river and explore to your heart’s content. You may even stumble across the cycle track in the woods so don’t forget to bring your bikes with you! For a little more adventure, why not book a Land Rover Experience at the course on site (by direct arrangement with the owner). Just a few hundred yards away is the A59, but Eden will feel like a million miles away. Just 3½ miles away is the busy town of Skipton with its long, cobbled high street, an eclectic mix of independent and high street shops and an abundance of cafes and tea rooms await. Stroll along the canal, through the woods or discover Norman history at Skipton Castle. Within 10 miles drive is Malham with its breathtaking 260ft high limestone cove. If you’re feeling fit, climb the steps to the top where you’ll be rewarded with magnificent views down the dale and be able to see one of the finest examples of limestone pavement in the country, which was also used in a scene from one of the Harry Potter films! Alternative easy walks include Gordale Scar, also a film location for Harry Potter. For a relaxing day out venture further into the Yorkshire Dales to the picturesque villages of Grassington, 12 miles, and Kettlewell, 5 miles further, calling at Kilnsey Trout Farm on the way and a stop off to watch the climbers hang off Kilnsey Crag. Many walks and cycle routes for all abilities can be found here and all around the area. Country pubs serving local produce are within easy reach of Eden should you wish to dine out during your stay, with the closest just 500 yards away and easily reached via a stroll through the estate grounds. Eden provides a tranquil retreat away from the hustle and bustle of everyday life but will come alive when filled with your family and friends, yet is within very easy reach of the main town of Skipton and surrounding attractions – what more could you want!? The shops are 3½ miles from Eden near Skipton, with the pub/restaurant being 500 yards from Eden. Living room: With wood burner, 32 Freeview TV, DVD player, iPod dock, beams, wooden floor and French doors leading to garden. Kitchen: With breakfast area, electric Range, microwave, Fisher and Paykel fridge/freezer, dishwasher, DAB radio, stone floor and French doors leading to garden. Utility room: With washing machine and stone floor. Bedroom 1: With super king-size bed and French doors leading to garden. Bedroom 2: With twin beds, vaulted ceiling, beams and French doors leading to garden. Bathroom: With bath, hand held shower, shower cubicle, toilet, heated towel rail and tiled floor. Separate toilet: With heated towel rail and stone floor. Bedroom 3: With king-size bed and en-suite with bath, hand held shower and toilet (Jack and Jill shared with bedroom 4). Bedroom 5: With super king-size bed, double sofa bed (for 1 guest), dressing area, beams, wooden floor and en-suite with bath, hand held shower, shower cubicle, toilet, heated towel rail and wooden floor (Jack and Jill shared with bedroom 6). Bedroom 6: With twin beds, beams and wooden floor. Biomass/oil central heating, electricity, bed linen, towels, Wi-Fi and logs for wood burner included. Travel cot, highchair and stairgate available on request. Welcome pack. External room with bar and children’s play area. Large garden with garden furniture and gas barbecue. 3000-acre grounds (shared with other properties on site). Wood-fired hot tub for 6 (private). Private parking for 20 cars. No smoking. Please note: There is an unfenced river in the grounds, 100 yards. Holidays at Eden run from Monday to Monday. For a better idea of where Eden is, you can see Eden on the map below. Eden is in North Yorkshire; should you be on the lookout for a special offer, you can find all the special offers in North Yorkshire. It's always worth checking to see what is on offer at the moment. Do you want to holiday near Eden (UKC2582), you can see other cottages within 25 miles of Eden; have a look to find your perfect holiday location.